Kids will be kids. They can talk, scream and constantly ask you things throughout the day. They behave and then they can misbehave a second later. Parents love to have a break now and then, just to hear the peace. But when the kids are home and it's quiet... a little too quiet. Then it can make you a little nervous. Well it makes me nervous!! What 5 things can your kids get up to when they are quiet...? 1. Playing in the bathroom. Oh the joys of finding them in the bathroom, soaked through. Toilet roll down the toilet, toothpaste and shampoo everywhere and on the kids too! 2. Drawing on walls. Most kids think they're artists and we praise them for their art work BUT WHY OH WHY! draw on the walls?!! 3. In your bedroom. Oh yes. You tell them every single day NOT to go into your room. But you end up finding them jumping on your bed, taking something and loosing it, oh and emptying all your cupboards and draws. Don't forget plastering themselves in make up and painting their nails too! 4. Sleeping. Why do kids feel the need of napping about an hour before bedtime? Even though you would love it if you could leave them to sleep, they haven't had any tea and you know it wouldn't be worth it when they wake up in the middle of the night at so damn early in the morning! 5. Hiding. 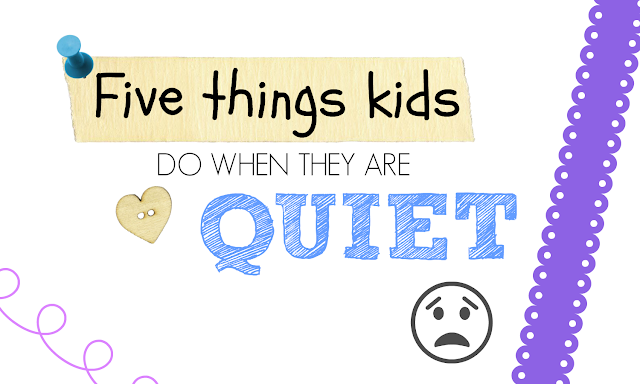 Ever had that time when the kids were quiet. You go to check up on them, too see what they are doing. But. You can't find them. You shout their name and then 10 minutes after you hear giggles coming from the wardrobe! Happened to me... plenty of times. I have experienced every single one of those above. Although, Mia is older now so she can happily sit down and colour or write. But when she was younger she was a right terror. Elliw is still at that age of exploring and pushing my buttons, sometimes Mia will join her too! Have you ever experienced any of the above? If not, what do your children get up to when they are quiet? Yes these all seem very familiar!!! lol! Ugh, we pay for the peace and quiet with the clean up operation don't we?! Oh yes! OOORRRRR eating something that they have 'found'! YES! I have one of these little people in my house. She is into everything. Silence is suspicious here. Visiting from Let Kids Be Kids linkup.